Ever dreamed of heading for a Central American paradise? Fancy winning a share of 1 million BRK cryptocurrency coins? Interested in doing either for free?! 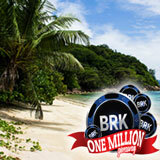 The Breakout Gaming Group is offering gamblers the chance to win a dream holiday to Costa Rica or a life-changing bitcoin prize in its enticing new promotion, 'BRK Free – 1 Million BRK Giveaway'. Simply by registering to Breakout Gaming Group's suite of gaming and gambling platforms, you could be in with a chance of winning virtual currency and a whole host of other prizes – many of which will not cost a single penny to enter. A trip to Costa Rica, where you can enjoy the beautiful scenery as well as meet the Breakout team, is up for grabs. There's also a slew of other prizes such as cash, merchandise and free entry into tournaments. To be in with a chance of winning, check Breakout Gaming Group's websites every Monday to keep abreast of that week's entry criteria. The Breakout Game Store and other affiliated websites will also offer prizes. So sign up to Breakout Gaming and get your suitcase primed and bitcoin wallet ready!